You may have seen his name in headlines as of late and have been left wondering—who is Adam Schiff? Adam Schiff is an American politician—more specifically, a senior representative of the Democrat party of the House Intelligence Committee. He’s served in Congress since 2001, and has become an increasing influential voice for the Democratic party on things like foreign policy and national security issues. If you’re aware of the political climate in the United States right now, then you can probably make an educated guess as to why he’s been gracing headlines lately. Adam Schiff and Donald Trump have had a bit of a run-in, we’ll call it. Not physical, of course—they’ve mainly stuck to the president’s favorite platform, and exchanged words over Twitter. To learn more about this Democrat currently in the spotlight, keep on reading for Adam Schiff’s wiki. Adam Schiff’s family home was in Massachusetts, where he grew up. However, he moved to California when he was older, and earned a degree in political science from Stanford University. He then went on to attend Harvard Law School. When he completed his education, he began working at the Los Angeles branch of the U.S. Attorney’s office as a prosecutor. While this was still early on in his career, he gained some recognition for his prosecution against former FBI agent, Richard Miller who was convicted for passing secret documents to the Soviet Union. In 1996, he was elected to the California State Senate, and is currently serving his ninth term in Congress. He’s has a successful career in politics, and has yet to retire. 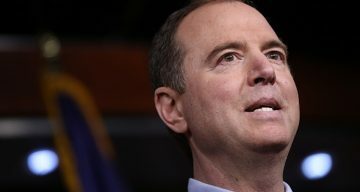 Adam Schiff’s net worth was estimated to be approximately $1.74 million in 2014, and he’s rumored to have about $100,000 in Apple stock. While pursuing a very fruitful career in politics, Adam Schiff, age 57, has also managed to foster his family life as well. He’s married to Eve Schiff, and the couple has two children; Adam Schiff’s kids are named Alexa and Elijah. With a focus on physical fitness, he also makes a point to participate in numerous physical activities, including triathlons and marathons. In 2014, Schiff joined in the AIDS/Lifecycle, a seven-day charity bike ride from San Francisco to Los Angeles. What prompted the harsh tweet from the president? On Sunday, Schiff expressed his thoughts on the relationship between Trump and Russia: “The president is clearly worried” about accusations that Russia laundered money through the Trump Organization,” said Schiff. “What concerns me the most is anything that could be held over the president’s head that could influence U.S. policy,” he added.